Students at Shaw Avenue Elementary School received a meaningful and memorable lesson in kindness and anti-bullying, thanks to an entertaining presentation from the Box Out Bullying organization. 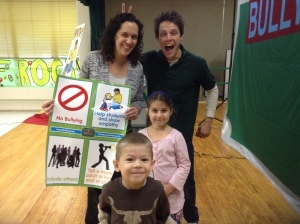 Program hosts Tom and Jerry, who portrayed cousins, made use of acting, humor and student involvement as they conveyed important messages about bullying prevention. On stage with the duo, front and center, was a locked box that Tom found highly intriguing. As he and Jerry reflected on situations involving bullying and how to properly handle them, they suggested that the box would open when the students were ready for its contents. The students, the speakers explained, had the power to open the box by solving the problem of bullying. Students in the audience also learned about empathy and what it means to know another person’s feelings or problems. They were told how they can include one another so that nobody feels badly or left out. Tom and Jerry also shared tips for handling bullies, such as telling an adult at school as well as someone at home. Once the children showed that they fully understood the rules against bullying, specifically the promise that, “We will not bully others,” the box was opened. With the assistance of students Malikah Mian and Sergen Enosse, along with teacher Mrs. Kollar, Tom and Jerry reiterated ways in which students can make a positive difference in their school, families and community by helping others and being kind.